Another adapted idea from our popular helen dress. Funky and fun design, versatile and unique. Elastic back waist, dropcrotch style pants. 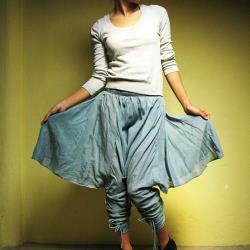 With skirt-like ruffle on the side. The most funky part is the leg of the pants. 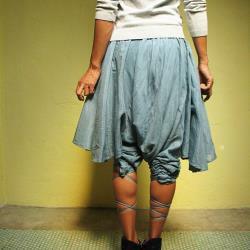 Drawstring on both side of the leg that you can adjust the lenght, when you draw, it create a ruffle, curtain effect. You can draw the leg all the way up and get a balloon skirt look. 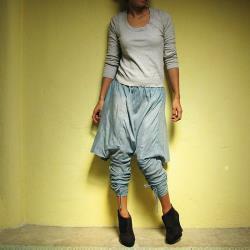 Or pull it down capris lenght of full lenght. Great, elegant piece that is also very playful. Lenght of skirt part 24. (for your reference model is a size 6 with 34" bust, 37" hip and 5'4 tall). If you have some specific request or special character such as broad shoulder, long arms, long waist, etc you think we need pay attention to when making, do let me know. Warning : our all colors in listings could be looked differently in the range of 20% from the real colors of cloths because of picture works which were not professionally done. 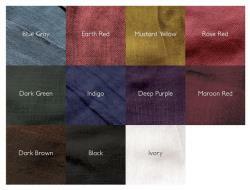 Besides our any white color is not bleached one. We respect the comfort of wearing so that we use natural white which looks more ivory. Even if our listings pictures look very white, actually it is never bleached white. Please accept these color complexities. Don't hesitate to contact me with any questions, i'd love to help. Our usual turn around time is 2-10 days. Your package will be sent as soon as the item(s) are ready.